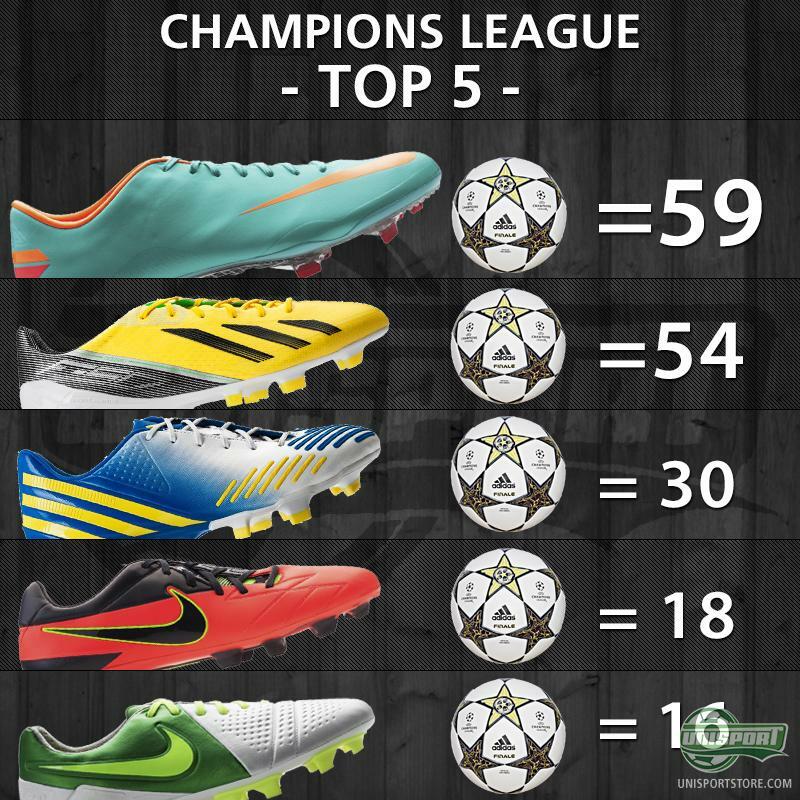 Champions League - Most scoring boot 2012/13: Round 5. This weeks Champions League round is over, just as it was the end of the line for a few big clubs, in Europes most prestigious tournament  So now it's time to turn our attention to the table... No, not the groups, but rather our Most scoring boot table. It was a round that started off slowly in the goals department, but definitely caught up well later on. So read along to see if your boot is in the Top 5. Nike Mercurial Vapor VIII had to revenge itself from last week, where its closest competitor Adidas F50 Adizero, had almost caught up entirely. It turns out it did get its own back, but if that was fair is disputable, because one of its goals was scored by a certain Adriano from Shaktar Donetsk, who was involved in a somewhat farcical fair play incident. It was Adidas F50 Adizero, who hit the ground running, when Barcelona in Group G, played the early game against Spartak Moscow. The Catalan's leading light, Lionel Messi, barely has to touch the ball these days, before it ends up in the back of the net and in the cold of Russia, not even the weather gods couldn't contain the Argentinian. He scored twice and watched as Dani Alves completed the Adizero hattrick. In the other group G game, Benfica edged ever closer to the final 16, when they collected a very important victory against the always resilient Celtic. It was the former Real Madrid player Ezquiel Garay and new player Ola John, who scored the goals and for the Scots it was the Greek Samaras, who put his name on the board. Nike Mercurial Vapor VIII did, however, quickly catch up and this was, unfortunately, at the expense of Unisports Danish countrymen, FC Nordsjælland. The two Brazilians; Adriano and Willian, scored a combined 5 goals in Parken, Copenhagen and especially the one goal, we will be discussing and cursing for a very long time  It really was an insufferably unfair goal, that the first mentioned of the two scored. In the same group Juventus and Chelsea clashed and it would turn out to be the last time we saw Roberto Di Mateo in a Chelsea dugout. It was a comprehensive and comfortable 3-0 dismantlement of Abramovich's men, where goals from Sebastian Giovinco, Fabio Quagliarella and Arturo Vidal put the last nails in RDM's coffin. This was also where both Nike T90 Laser IV and Nike CTR360 Maestri III made their mark. We will stay in Italy for the time being, because there's no way we weren't saluting this rounds undisputed best goal. It came from the French charlatan Philippe Mexes from AC Milan, when he chested the ball and guided the ball into the goal with a superior overhead, past the awestruck keeper. The goal help secure a comfortable 3-1 win against Belgian Anderlecht, even though Mexes hadn't pulled on the new Adidas F50 Adizero. We can without stepping on too many feet, say that Malaga have been this years big surprise, they have with visually pleasing play, brought home great results and thus confirmed their place among the illustrious final 16. They shared the points with Zenit St. Petersborg and now advance as number one in the group with a draw in their last game. 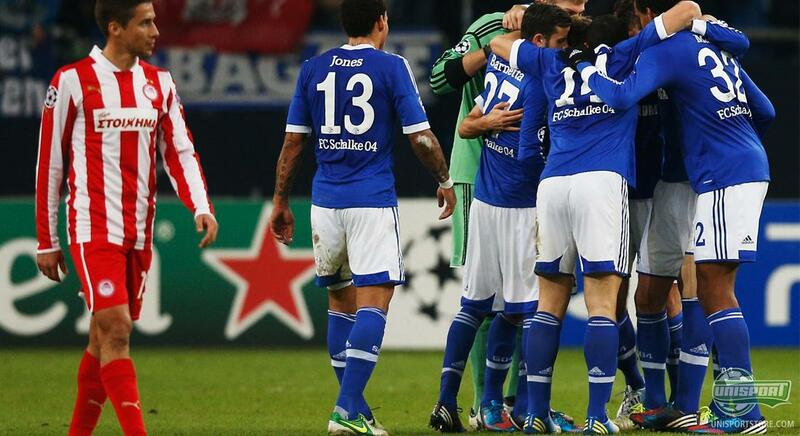 Schalke 04 also advanced from the group stages and that came from a pair of Adidas Predator LZ on the feet of Christian Fuchs. The 1-0 lead held all the way through against Olympiakos and this also meant, that Klaas-Jan Huntelaar couldn't add to his impressive goal-tally in the Champions League, with his Nike T90 Laser IV, but there was however another Bundesliga-striker who could. Before we get to that, we start off with a former Bundesliga player, Lukas Podolski. He changed to Arsenal in this summers transfer window and has now really begun banging in the goals for his new club. He closed the game against Montpellier in stunning fashion, while wearing his new Adidas F50 Adizero Yellow/Black, which also secured them a spot, as a Champions League contender. If anyone was in doubt, it was of course Borussia Dortmund's Robert Lewandowski, we were talking about earlier and with two goals in his Nike T90 Laser IV, he brought the boots total round tally up to three. On top of that his goals also helped BVB, out of the group of death, as number one. An impressive feat, when considering the company they were in, but they certainly made quick work of the Dutch champions from Ajax, with a 4-1 demolition. The groups second game was between Manchester City and Real Madrid, who had to share the glory, even though it for long periods of the game, looked like the Spanish Champions would bring home the three points. A very cheap penalty and red card did however change the game, as Sergio Agüero was cold as ice from the penalty spot, in his new Puma EvoSpeed 1 Green/White/Blue. Just about every boot was represented in this rounds football and even the French brand Kipsta made itself heard, as Gianni Bruno scored, while wearing a pair of those. It did, however, end up being Nike Mercurial VIII who, with 15 goals this round, retained the title, ahead of Adidas F50 Adizero (13 goals). This means, the top 5 is in fact completely unchanged. It also looks like the only contender to the Vapor VIII, is the Adizero  Does this surprise you? Are there any boots, that you feel have been a let down? Let us know in the comment-section down bellow.